Most people, if not all of you will remember driving around in a bumper car in your earlier years (if not still today). The problem was that you had to stay with in the boundaries of the bumper car track. Now the bumper car has broken these boundaries and is now named the bumper car car. 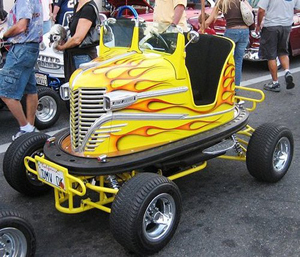 These bumper cars are retro fitted with 750cc Kawasaki engines and have been made street legal. It costs a hefty $50000 to modify them to being street legal, but if I had a spare 50 grand I certainly would want to drive around my home town in them for fun. A full gallery can be found over on Flickr. $50,000 to modify a 50’s era bumper car to be street legal? You’ve got to be kidding me.